We are trying to institute a new national holiday: National Socks for the Homeless Day on Valentine’s Day. 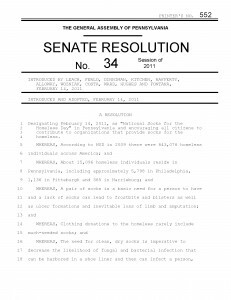 PA Senate Resolution 34 National Socks for the Homeless Day. The Joy Of Sox socks for the homeless. So in addition to giving your loved one flowers, candy and a card on Valentine’s Day we also want you to remember the homeless by donating a package of socks to a local shelter OR making a donation to The Joy of Sox to help support its mission. Many people are very generous around the end of the year with holidays such as Christmas, Hanukkah and Kwanzaa. But in many parts of the county February has worst weather than December…and the homeless seem to be forgotten by then. And since the homeless may need a pair of new sock every two weeks or so, wouldn’t it be a wonderful thing to do get them some nice new socks in the dead of winter on Valentine’s Day (February 14th in the United States). Nothing says Valentine’s Day better than by donating new warm socks to the homeless. National Socks for the Homeless Day on Valentine’s Day!